I've been MIA a bit lately—but for good reason...My husband and I welcomed a sweet baby boy into our lives in March! He is perfect and we are just smitten with him! It's been quite a journey, from the pregnancy to these past few months of major sleep deprivation. But we couldn't be happier! My first "project" once I got back into the studio, was of course a hand-lettered birth announcement! Photography by the talented Abby Cope. I'm enjoying a fun summer of baby snuggles and lots of exciting firsts as we watch him grow. I've also recently gotten back into my studio with some fun illustration & lettering projects—and looking forward to picking up speed with lots more fun work on the horizon. Stay tuned for updates! 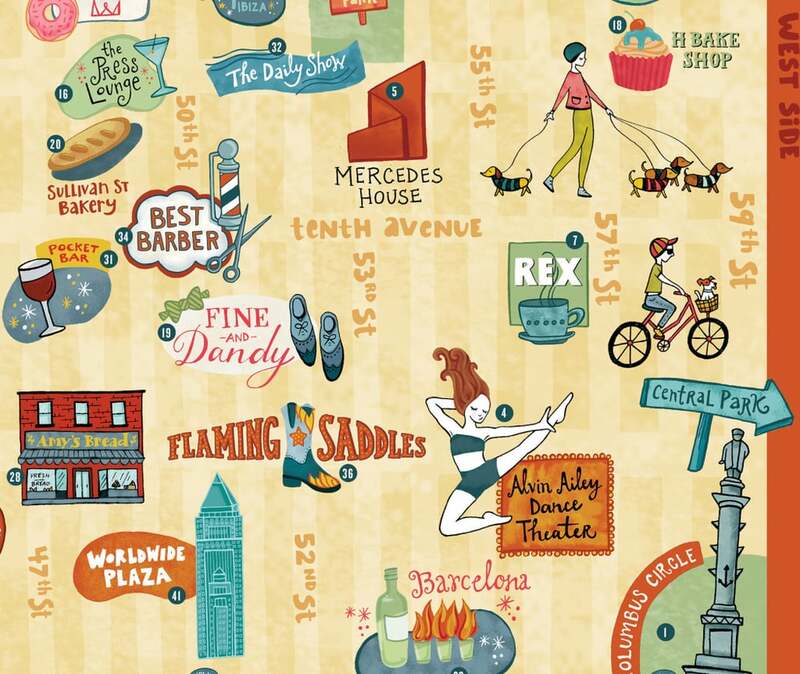 I was thrilled to wrap up 2015 with a really fun assignment for the awesome folks at W42ST. 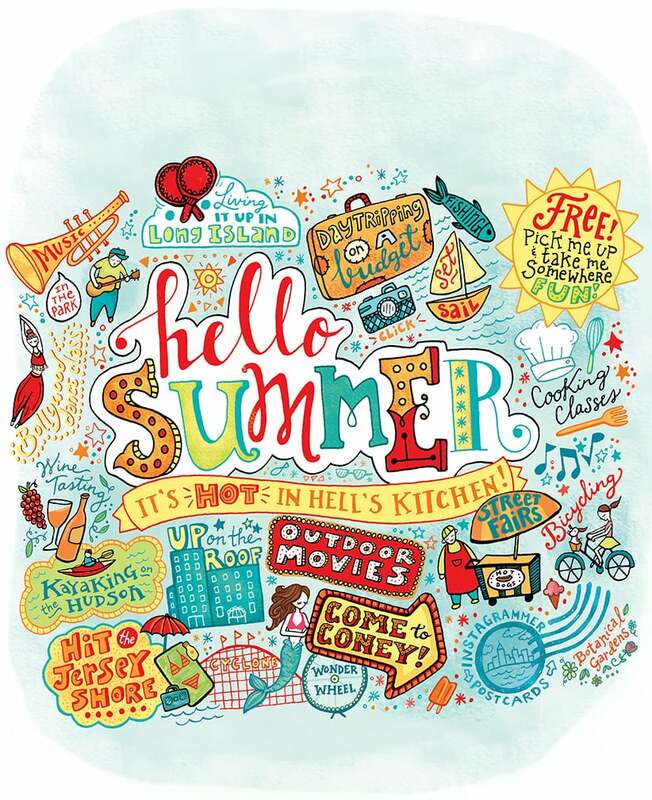 I loved collaborating with them last summer on a cover for their publication, which features all kinds of great things to see & do in Hell’s Kitchen, so was super excited when they called about another project. 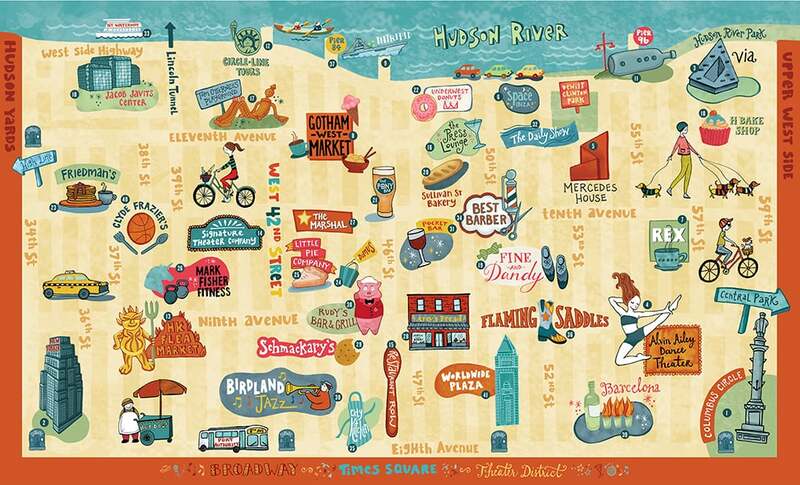 They wanted to feature a gate folded map in the back of the magazine, pinpointing landmarks as well as some the best shops and restaurants in the area. It was super fun to dive into the research and take a little walk down memory lane of some of my favorite haunts in my old stomping ground. They hope to use this map in each issue moving forward, and possibly add featured sponsors to the map each month. I lived in Hell's Kitchen for 3 years, so the neighborhood and this magazine have a special place in my heart, which made the job extra fun! The January issue is out now—available in coffee shops, bars, restaurants, and other places throughout Hell's Kitchen—and the online edition can be seen here. I've long wanted to participate in Minted's design challenges, as I absolutely love their beautiful collection of invitations, cards, and stationery. So I've finally submitted, and voting is open for the Wedding Suite Challenge! Here's my design, very much inspired by the save-the-dates I created for my own wedding! Winners are picked to be sold on Minted.com, so please stop by and give a vote for me! Thanks! I always love working with my old friends and colleagues at Penguin Books, so when AD Irene Vandervoort asked me to take on this fun middle-grade cover I jumped at the opportunity! This is a funny and sweet middle-grade read about a southern girl, with a passion for cooking, who feels like a "leftover" from her divorced parents' marriage but eventually comes to realize her very important place in her new blended family. After exploring lots of concepts—including graphic, type-driven, and photographic approaches, we decided to play off the "leftovers" title and I created this fun typographic illustration. The book pubs next spring, but is available for pre-order now. 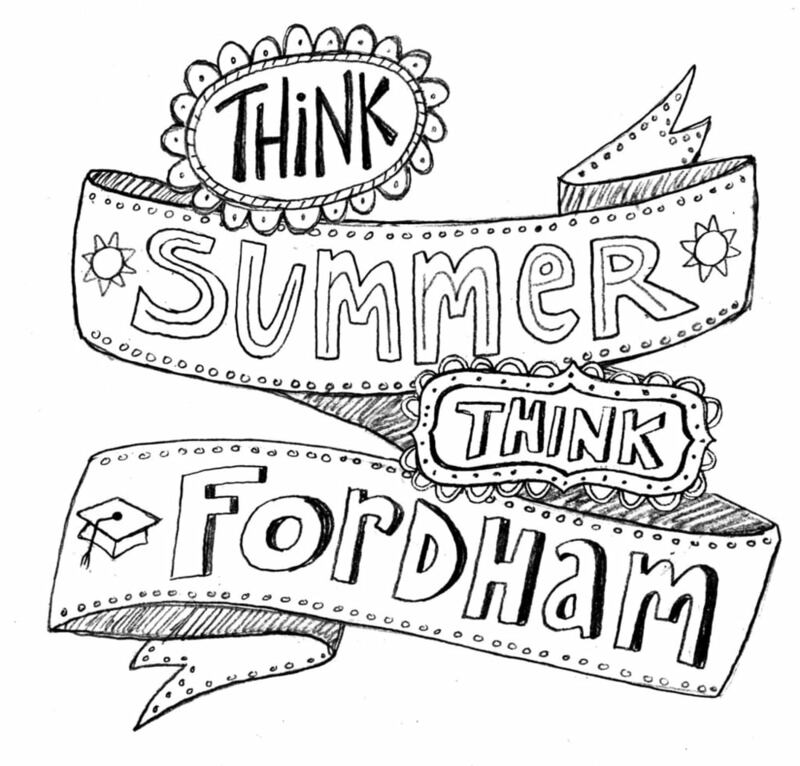 I was super excited when Fordham University asked me to create an illustrated headline for their Summer 2016 program. 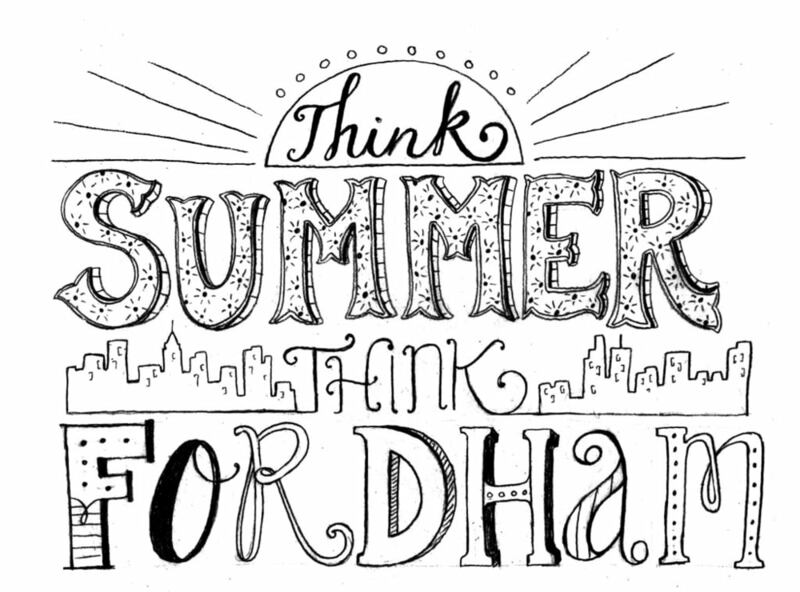 The tagline is "Think Summer, Think Fordham" and will be used on all the marketing materials for next year's session. They were really fun to work with, giving me a lot of creative freedom with how to interpret the slogan and represent both city and academics in a fun way. Here are a few of my sketches along with the final piece. 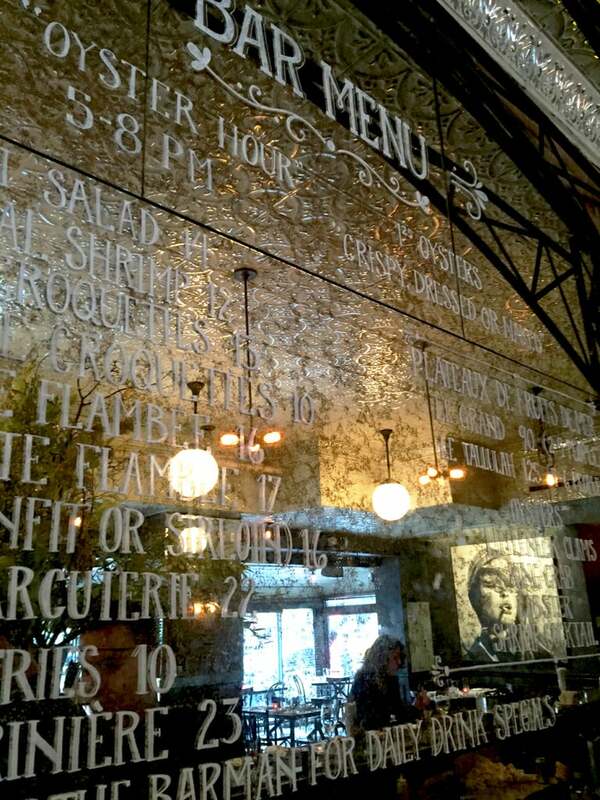 Another fun food-related project came my way recently; I was commissioned to hand-letter a bar menu on a large mirror of Cafe Tellulah, a French-style bistro on Manhattan's Upper West Side. This one was a fun challenge! It was a very large mirror (5' x 12'!) and the execution had to be completed in one day, during off-hours. But very cool to have the opportunity to create something on-location like this. It's always so hard to get good mirror photos because of reflections, and even more so here because of the size, but here's the sketch/mock up I created along with a few shots—and a video clip of me in action! Earlier this year I had the opportunity to create some hand-lettered branding for a middle grade series by celebrated authors Laurence Yep and Joanne Ryder. It's always a pleasure to work with the creative folks at Random House, and was fun to work my lettering into the illustrations of Harry Potter artist, Mary Grand Pre. Both books available now on Amazon. I always love working with the creative team at Sourcebooks, and this cover was no exception. I was asked to redesign the cover for Pippa Morgan's Diary, the super-secret diary of a 10-year old girl with a BIG imagination who's life is just not going well at all! This is an already established series in the UK, so I was required to create the art in a style that reflected the character and interior illustrations, and the AD had specific concepts to follow. But it's a super fun format and a hilarious read, so dove right in and had a lot of fun with it! Available to pre-order now on Amazon. Hello Summer! It's hot in Hell's Kitchen! I've been a resident of the Hell's Kitchen neighborhood in NYC for the last 3 years, and absolutely love it—such a vibrant neighborhood and great community! 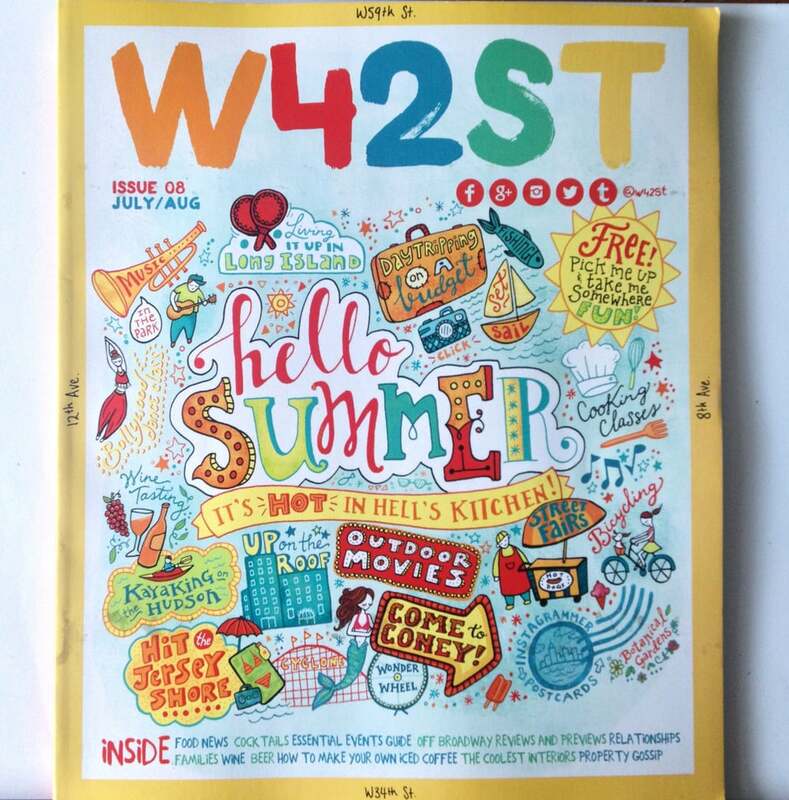 So I was thrilled when w42st Magazine, a free publication & online resource featuring all the fantastic things there are to see, do & eat in Hell's Kitchen, asked me to create the cover for their "Summer Fun" issue. They gave me tons of creative freedom with this, and I loved illustrating something I have such a personal connection to. The issue is out now! The online edition can be seen here, and printed copies are free in coffee shops, bars, restaurants, and other small local businesses & residential buildings throughout the Hell Kitchen area. I had the exciting opportunity to create the cover illustration for this month's issue of Public Power, a trade publication of The American Public Power Association, with national and international distribution. The AD had the concept pretty solidly in mind, and it was right up my alley! 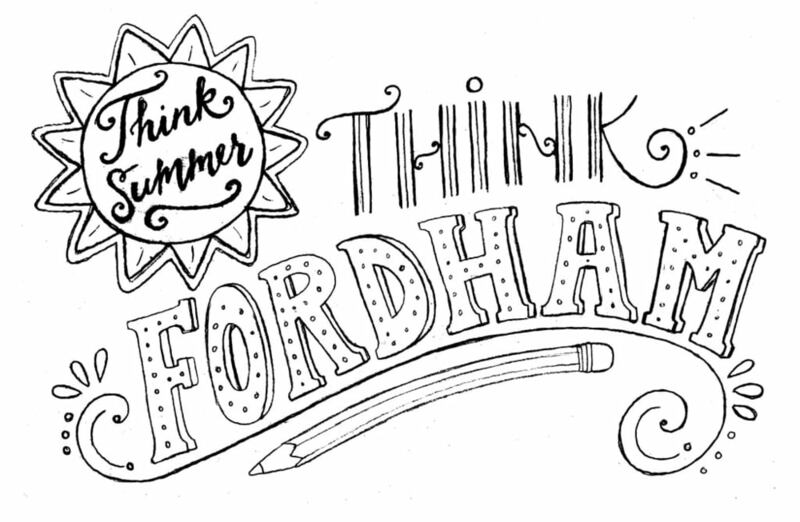 I love drawing type by hand, combining styles in an illustrative way to represent the article's themes. Thanks to AD Laura D'Alessandro for this great assignment! I recently had the great opportunity to work with Sleeping Bear Press on a new middle-grade book series, "Stage Struck" by Anya Wallach. I designed and illustrated this cover for the first book, including the hand-lettered branding that will be carried over to future books in the series. The series is closely based on the real-life experience of Wallach, who began a summer theater “camp” in her parents’ basement when she was just sixteen years old and formed Random Farms, which has launched the careers of many of today’s youngest stars on Broadway. Many thanks to AD, Jennifer Bacheller, for this fun project! I was super excited to get a private commission last month for a custom wedding illustration. In the midst of my own wedding planning, love is definitely in the air and on my brain—so I was in the right mindset! I was contacted by the couple after they saw this piece I created for a friend last year. They described themselves as "explorers" and each other's "navigators and co-pilots" with "an unhealthy inclination to sweets". I immediately fell in love with them, and was totally on board to create something special for their big day! This was to be used as an opening page of the guest book at their wedding, later to become a journal of sorts to document future important moments and celebrations in their lives together. I drew inspiration from vintage flying machines and a candy-colored palette to create a whimsical image that felt just right for them—and they loved it! I loved creating this—the themes were right up my alley! Plus, because most of my work is a combination of traditional and digital media, I loved getting back to full-on painting. Wishing many many years of love and happiness to this very "sweet" couple! I was recently commissioned to redesign a really cool YA post-apocalyptic thriller series for Skyscape. The art director had a fantastic vision for these, with a focus on hand-lettered title type design that would turn from orderly and a bit futuristic to "deviant", swirling and splitting off into different directions that would snake around the cover. Laying the decorative type over an atmospheric stock photo would give these books a futuristic, dystopian feel. I sketched out a bunch of different type styles for these, and we developed one into something that has a sort of decorative circuit board feel that conveys the sci-fi tone of the series. I really love how the final covers turned and it was SO fun to get to create custom lettering in such a decorative, elaborate style! Many thanks to Katrina for the project and great art direction!